Very good taste and consistency for a pure food product. 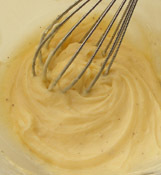 it's not easy to replicate the taste of commercial mayo which we're used to especially with homemade. I like that it contains coconut oil though I'd prefer to stay clear of seed oils. Sesame oil has a very high level of mega 6 polyunsaturated fat in the 40% range. Soybean oil comes in around 50% as a comparison.